Work: Town Clerk, Selectman, Provincial Representative, Council to the Legislature. Elected State Legislator, delegate to colonial conferences, 1775; Elected to Continental Congress, 1776-77; Delegate to the Connecticut convention to ratify the federal Constitution, 1787; Judge of the Windham County Courthouse. His biography notes that William Williams was a successful merchant, but it is difficult to imagine when he found the time. Born in 1731, he attained a common school education. He attended Harvard and graduated in 1751. He then studied theology with his father, Pastor of the First Congregational Church in Lebanon. Four years later, he joined his father's cousin in the French and Indian War at Lake George. When he returned, he established himself in Lebanon as a merchant, and also took a job as town clerk. He held that position for forty-four years. He was a Selectman for twenty-five years, served the provincial and later state Legislature for nearly forty years-during which time he was councilor, member, and Speaker of the House. He was elected to the Continental Congress in 1776. He arrived too late to vote for Independence (he replaced Oliver Wolcott, who became seriously ill), but he did sign the Declaration, and was then appointed a member of the committee to frame the Articles of Confederation. In 1777 he was appointed to the Board of War. 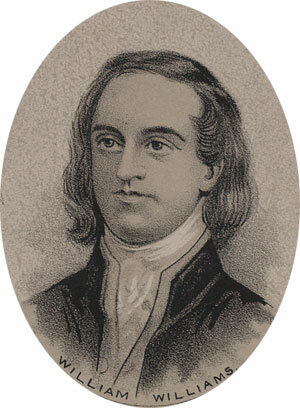 After the war, he attended the Hartford convention, where Connecticut ratified the Federal Constitution. Williams spent his remaining years as a County Court judge. He died in 1811 at the age of 80.